Mikhail Gorbachev – Nobel Peace Prize laureate and former President of the USSR – is the Founding President of Green Cross International, which he established in 1993 in response to the 1992 Rio Earth Summit call to create a “Red Cross for the environment”. 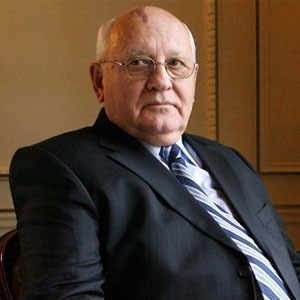 Mikhail Gorbachev was born on 2 March 1931 in the village of Privolnoye, Krasnogvardeisky District, Stavropol Terrritory, in the south of the Russian republic to a peasant family. A trained lawyer, Mikhail Gorbachev entered into politics at an early age, rising fast through a variety of Komsomol positions between 1955-78 in the Stavropol Territory, and taking on, in 1970, the region’s highest post of First Secretary. In November 1978 he became a Central Committee Secretary and moved to Moscow. His first assignment was overseeing the country’s agriculture but soon started to influence other areas of the Central Committee’s activities. Two years later he joined the Politburo of the CPSU Central Committee, the highest authority in the Party and in country. In March 1985, after three General Secretaries in a row passed away, Gorbachev was elected General Secretary of the Party Central Committee – the highest post in the nation and party hierarchy. In 1990 he became the first President of the USSR. Gorbachev initiated the process of change in the Soviet Union – what was later called perestroika, the fundamental transformation of the nation and society. Glasnost became perestroika’s driving force. A sweeping process of the nation’s democratization was launched and reforms were planned to put the nation’s ineffective economy back on track and more in line with market economics. Gorbachev’s actions created a big shift in international affairs. The new thinking associated with the Gorbachev name contributed to a fundamental change in the international environment and played a prominent role in ending the Cold War, stopping the arms race and eradicating the threat of nuclear war. The Congress of People’s Deputies of the USSR – the first parliament in Soviet history, made on the basis of free and contested election – elected Gorbachev President of the USSR on 15 March 1990. In recognition of his outstanding services as a great reformer and world political leader who contributed greatly to the changing nature of world development, Mikhail Gorbachev was awarded the Nobel Peace Prize on 15 October 1990. On 25 December 1991 after dissolution of the USSR, Gorbachev stepped down as Head of State. Since January 1992, he has been President of the International Nongovernmental Foundation for Socio-Economic and Political Studies (The Gorbachev Foundation). Since March 1993, he has also been President of Green Cross International – an international independent environmental organization with activities ongoing in over 30 countries. Of particular concern to Mikhail Gorbachev, and a central pillar to the work of Green Cross International, is advocating for environmental and developmental sustainability in the face of threats posed by over consumption and use of fossil fuels, development of nuclear technology and growing gap between rich and poor.